Passages to the Past: Which Jane Austen character are you? Which Jane Austen character are you? Sweet - Sense & Sensibility is one of my all-time favorite movies and I just adore Kate Winslet!! I love these quizzes. I was Marianne Dashwood in this one and Catherine de Medici in the queen quizz. My luck I would probably wind up being Major brandon.. even though I'm female.. So tell mw, where are you finding these quizzes? 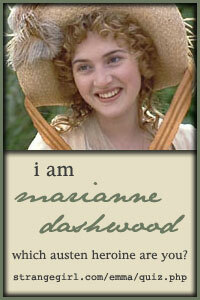 I am your sister, Elinor Dashwood. I have taken this quiz a number of times, and always come out as Elinor. Though in college, for a short dramatic piece, I played Marianne, and did a good job in the role if I do say so myself. Lilly - love the avatar - that bunny really cracks me up! Oohh....Catherine de Medici huh? Hope it's not because you like to play with poison! Ha! Nan - at least Major Brandon is a gentleman - you could've gotten Willoughby! I saw this one on Miss Holly's Library blog. Book Lover - A little bit of both eh, I don't think that's too shabby as they are both marvelous characters! You are Anne Elliot of Persuasion! Let's face it; you're easily persuaded, particularly when friends and relatives try to use "the Elliot way" against you. But this doesn't mean that you don't have conviction. Actually, your sense of duty is overwhelming. And though you won't stick your neck out too often, you have learned to speak up when it counts. To boot, you know how to handle sticky situations. You love deeply and constantly. Mailbox Monday - Christmas edition!